Nephrologists are physicians who specialize in the diagnosis and treatment of kidney disease. What conditions are treated by a kidney doctor, and when is a referral to one of these specialists needed? If you haven't heard about nephrology (the study of kidney disease) before, it's not surprising. Chronic kidney disease (CKD) is often referred to as the "silent killer," as many people have mild symptoms or no symptoms at all when they are diagnosed. There are many different terms which can be used to describe kidney disease which can add to the confusion. As noted above, Nephrologists are doctors who treat kidney disease, with the Greek term "nephros" meaning kidneys. You may also hear the term renal disease used to describe kidney problems. The term renal comes from the Latin root "renes" which also means kidneys. What types of medical conditions may affect your kidneys, what are some of the common symptoms, and when you should be referred to a nephrologist? 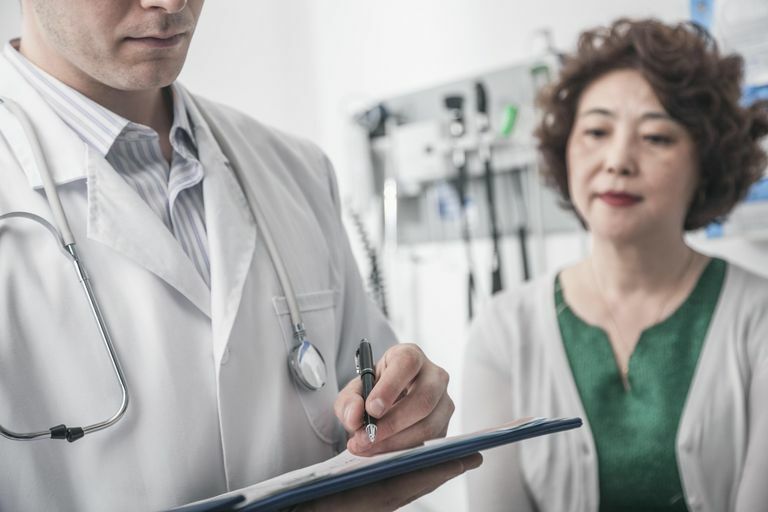 Studies suggest that delaying a visit to a nephrologist can increase your risk of complications or even death, so this is an important question. Glomerulonephritis: Glomerulonephritis is an inflammation of the kidneys which can be caused by a number of different processes, including the bacteria which causes strep throat. Chronic kidney disease is described by 5 stages based on the severity of the disease. Grade 1 kidney failure refers to a mild disease, whereas grade 5 renal failure usually indicates that dialysis or a kidney transplant will be needed. In addition to managing kidney problems (trying to correct the condition or prevent it from worsening), kidney doctors manage the symptoms often associated with kidney diseases, such as electrolyte disturbances (especially problems with potassium levels) and high blood pressure. In order to understand the more common symptoms of kidney disease, it's helpful to review the structure and function of the kidneys. Your kidneys are located on your flanks, near your spine. Injuries to your back or side below your diaphragm may cause injuries to your kidneys. Your kidneys perform several important functions. These include filtering your blood to remove toxins, maintaining the proper levels of electrolytes (such as sodium and potassium) to ensure proper functioning of your cells, and maintaining fluid balance in your body. If you become dehydrated, your kidneys initially work to restore the fluid status to your body, but kidney injuries may occur with prolonged or severe dehydration. If your kidneys are not functioning properly, the level of sodium and potassium in your body may be affected. Electrolyte problems with kidney disease can be serious, Since the right amount of potassium is necessary for proper functioning of your heart, kidney problems may result in abnormal heart rhythms. Abnormal blood pressure, whether high or low can result in kidney damage. Kidney damage, in turn, can cause problems with regulating your blood pressure. The kidneys are also responsible for making a hormone involved in the production of red blood cells. For this reason, kidney disease can result in anemia, a lower red blood cell count. Some people have urinary problems, such as difficulty urinating. Occasionally people also have flank pain, due to the location of the kidneys. Kidney stones may herald themselves with severe pain which has been likened to childbirth but can be present without pain as well. Nonspecific or vague symptoms are common, and a reason why you should see your doctor even if you can't precisely identify your symptoms. These may include fatigue, insomnia, or a metallic taste in your mouth. Early on with kidney disease, and sometimes even with advanced kidney disease, people may have few symptoms. In fact, the most common symptom of kidney disease is no symptoms at all! There are several different types of tests which can be done to screen for and follow kidney problems. These include blood tests such as BUN (blood urea nitrogen), Cr (creatinine), and GFR (glomerular filtration rate), urine tests (especially looking for protein in the urine), and imaging tests such as CT, MRI, and IVP. The time it's best to see a nephrologist can certainly vary depending on your particular conditions. That said, you should ideally be seen by a nephrologist once your creatinine is high enough to be called CKD Stage 4. That would mean a GFR of less than 30. I am not emphasizing the importance of a referral to a nephrologist because I am one. In fact, multiple medical studies have clearly proved that patients who are referred late to nephrologists are more likely to die, or progress to dialysis! The treatments for kidney disease vary widely based on the particular cause. When kidney function is severely reduced a person may need dialysis for kidney failure or a kidney transplant. When it comes to living with kidney disease, recovery usually does not happen once your GFR has chronically declined to the advanced stages. Hence, the emphasis really needs to be on prevention. The next time you see your physician make sure to discuss the results of your GFR and ask if you should be seen by a specialist. The best time to see a kidney doctor will vary based on your kidney function, the particular renal condition you have, and other risk factors. It appears that a referral to see a nephrologist should be considered for an elevated Cr (stage 4) or a GFR less than 30, but some people should see a kidney doctor much sooner. Since timely consultation with a nephrologist is correlated with survival, it's best to err on the side of seeing one of these doctors earlier rather than later. Kim, D., Kim, M, Kim, H. et al. Early Referral to a Nephrologist Improved Patient Survival: Prospective Cohort Study for End-Stage Renal Disease in Korea. PLoS One. 2013. 8(1):e55323. Smart, N., Dieberg, G., Ladhani, M., and T. Titus. Early Referral to Specialist Nephrology Services for Preventing Progression to End-Stage Kidney Disease. Cochrane Database for Systematic Reviews. 2014. (6):CD007333. Smart, N., and T. Titus. Outcomes of Early versus Late Nephrology Referral in Chronic Kidney Disease: A Systematic Review. American Journal of Medicine. 2011. 124(11):1073-80.e2.